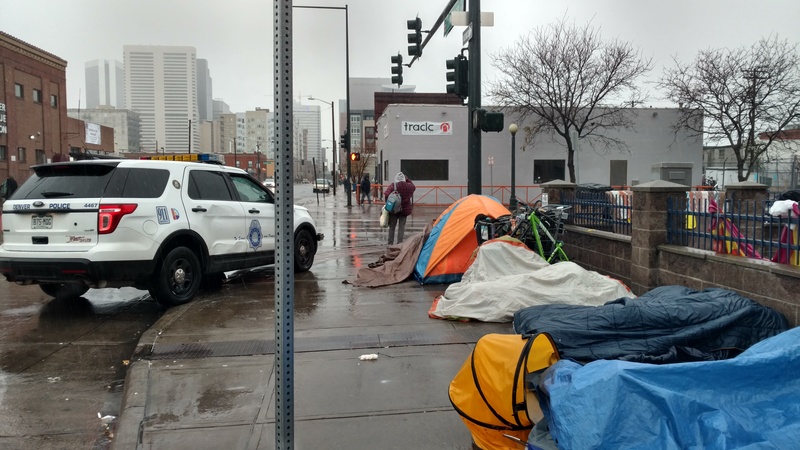 After 4 weeks of non-stop police sweeps of homeless people trying to survive the winter, the people of Denver are saying enough is enough and convening in public outcry to demand this displacement end. 319 sleeping bags will be collected and distributed to people living on the streets to represent the 3195 people who have been contacted by police for violating the survival ban (known as camping ban) in the last 9 months and forced to move along to nowhere. We refuse to sit back while the City sends police to sweep homeless people from sight. Police are forcing homeless people to stand up, take their blankets off, take down their tents, and move along in the cold. Right NOW this is happening right HERE in OUR city. We are converging together on Wednesday November 21st at 6pm to make our OUTCRY heard loud and clear by the City of Denver. We will take space in our city to try and exist in solidarity with those without housing — and in demand for the right to survive. One year ago this day Ink Coffee made a sign saying “Happily Gentrifying the Neighborhood since 2014” and the people of Denver responded in outcry demanding action to end this unabashed gentrification of our communities. Exactly one year later the City is sweeping every homeless person from the blocks two blocks away from that very coffee shop. This gentrification must STOP. Watch these, and more, livestream videos of the City sweeping hundreds of homeless people from the sidewalks on October 29th. How did the demonstration and occupation go on Monday? Is everyone safe? Did DPD hassle you ? I couldn’t make it thanks to having no car and still being in a splint from my shoulder surgery.